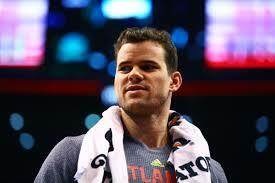 Coming out of Hopkins High School in 2003, Kris Humphries was a five-star recruit and a McDonald’s All-American – and he flirted with a decision to play in college or go straight to the NBA. Humphries was in the same class as LeBron James, who obviously decided the latter, got drafted No. 1 overall by the Cleveland Cavaliers and is one of the best basketball players of all-time 15 years later. Humphries, who played 14 NBA seasons, was still drafted No. 14 by the Utah Jazz after a dominant freshman year with the Gophers. Going to college and staying home was the right choice, he says. In an interview with the Star Tribune going into Thursday’s NBA Draft, Humphries talked about being the last Gopher player drafted, the One-and-Done rule, fellow Hopkins product Amir Coffey’s NBA potential and more. Q: Did you think after you were drafted out of Minnesota in 2004 there would not be another NBA Draft pick for the program 14 years later? A: You want to see your school does well. Obviously, a result of that are talented players getting drafted. There should’ve been a first round pick or at least a second round pick since me, given that Minnesota is in the Big Ten. The University of Minnesota has a lot to offer. It’s a two part thing. One is obviously talent. You’ve got to be talented to get drafted. And two, it helps when your team does well. If you struggle getting talent or to have success (consistently) than it’s hard to get that formula. Q: How much did you consider the prep-to-pros route that was allowed back when you were at Hopkins? Do you think playing for the Gophers for one year helped? A: I toyed around the idea of possibly going to the NBA out of high school. And it didn’t seem to be a good decision for me. Who knows if it would’ve worked out or not? When you’re a McDonald’s All-American and play in the Jordan (Brand All-American) game and have success in AAU ball, you’re definitely on the map to have that chance to go to the NBA out of high school. But going to college for a year worked out better. If I could’ve helped my team do better or been on an NCAA tournament team that probably would’ve helped me get drafted even higher. It can’t hurt. You definitely have to do more to get drafted on a team that doesn’t go to the NCAA tournament. You have to do a lot more and are under more scrutiny in the draft process. The NBA teams didn’t get to see you go against the best players in the NCAA tournament. They didn’t get a chance to see you on the big stage. Q: The NBA prohibited drafting high school players starting in 2006. Recent scandals in college basketball involving paying top recruits could end the ‘One-and-Done rule’ in 2021. What do you think about that rule? A: I think that it’s good for kids or young men to have the opportunity to come out of high school to the NBA. You can go out of high school to get a regular job or go out of high school to enlist in the military. So to limit somebody’s ability to work if they have the skills, it just doesn’t seem right. From the standpoint of the NCAA, they probably like having those kids in college, because they have that talent in their system. The NBA probably thought the rule helped kids become more ready maturity-wise. But if the age is 18 to serve your country, then you’ve got to be able to play in the NBA at 18. Personally, the one year helped me out a lot. I had the right people around me making the decision. I know having the one year to get stronger and not live in my parents’ house and live on my own, I think helped prepare me. I’m not against going to school, but it should be up to the individual player. Q: What are your thoughts on the Gophers program under Richard Pitino? A: I think it’s heading in the right direction. We’ve had some unfortunate situations in recent years with players, but as a fan you want to see us have the best chance out there. We’ve been through a couple tough years. I’ve had the guys out to my house and hung out. I got to know some of the guys. When I grew up, Amir Coffey’s dad (Richard) used to bring me to the gym when I was a kid. I’ve known Amir Coffey since he was born. They lived in the same neighborhood in Eden Prairie when I was growing up. Q: Was it cool to see Coffey follow in your footsteps from Hopkins to the Gophers? A: I was happy when he went to the U of M. I was actually at a Gophers football game when he was on a recruiting trip. That was kind of cool. My dad is a big supporter of the program. He was pretty on top of Richard (Coffey) about his son going to the U of M.
Q: What do you think it will take for Coffey to get drafted and play in the NBA one day? A: I think success for the team will help him a lot. If he plays well the team will also be successful. It goes hand in hand. It’s just about focusing on today. Don’t get too worried about the NBA. You just handle what you have to handle today and everything will take care of itself. That was kind of my approach. I wasn’t even thinking about the NBA. I was about waking up early in the morning and worrying about what I could do to be the best I could be. It would be very, very cool if Amir could be the next guy after me, with the relationship I have with his dad and knowing Amir since he was a baby. If you look at his body, his height and his skills and athletic ability, he has the tools. It just has to all come together. Q: Do you think the Gophers will be able to break that NBA Draft pick drought soon? A: I hope so. When you talk about guys getting drafted from the University of Minnesota and me being the last guy, you can be talented, but a lot of things have to go right for you to get drafted. It will be interesting to see. When will Gophers' 14-year NBA draft drought end?